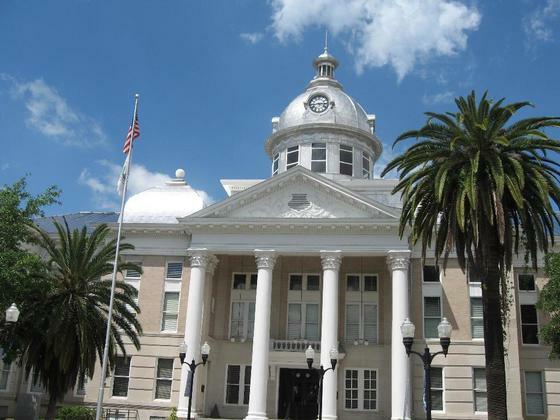 Is the Old courthouse in Bartow, Florida haunted? The Old Courthouse was built in 1909, a previous courthouse was built on the same plot of land in 1883 but was demolished. It is the 3rd building to serve as a courthouse in the area. The building is still open today but a newer, much larger courthouse has been built across the street which functions as the main courthouse for the area. There are many ghost story's for this location, some of the most common ones include hearing screams of pain coming from one of the 4 basements, it is the basement that can only be accessed by elevator. It is said that a worker was killed there from an explosion. Feelings of sadness have been felt by many when on the second floor area, as well as seeing the apparitions of two men, said to be the bodies of the Mann brothers, who were lynched by a mob for committing murder, their bodies were displayed in this area after they were killed. On the 3rd floor and near the second floor bathrooms, an apparition of a lady in white has been seen, who she is however, remains a mystery. The other most common report is of a room on the first floor that contains ancient Indian artifacts, strange things are said to happen in this room, from footsteps, to objects being moved and malfunctioning electrical equipment that was thought to be working perfectly.